"Kettlebell Swings - Kettlebell Workouts for Your Thunder God"
The kettlebell swing transformed movie actor Chris Hemsworth into a thunder god. Could kettlebell workouts do the same for you? There is nothing glamorous or 'Hollywood' about Russian kettlebells. Trainers who exercise with this old school item of exercise equipment disparagingly describe them as cannonballs with handles! So why are movie actors like Thor's Chris Hemsworth turning to low-tech iron balls from a bygone era when we are living in a surround-sound digital world? 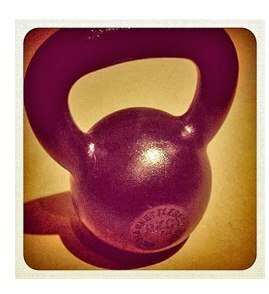 The answer: kettlebell workouts provide a challenging metabolic training system and are key to a lean and ripped body. Indeed, it is easy to buy the movie pitch when you understand how a low-tech exercise can quickly revolutionize your strength and health. And the best part? Because kettlebells train the whole body with one piece of equipment, workouts can be brief. Kettlebells come in poods, an old Russian measure of weight that equals 16 kilograms or approximately 35 pounds. For the average-sized man, it is recommended you begin with a 35 pounder, and women should start with an 18 pounder. As you become stronger, look to progress eventually to a 53 pounder - the standard issue size in the Russian military. The foundation of kettlebell training is the swing. This lung-bursting aerobic move works the arms, shoulders, legs and core. Writing in The 4-Hour Body, author Timothy Ferriss describes how he did nothing more than one set of 75 swings, twice a week on Mondays and Fridays. His goal? Ferriss wanted abs. Looking for more lung-bursting tips? Kettlebell Swing Cardio combines HIIT cardio and Kettlebell exercises to achieve excellent fat burning and muscle sculpting results. Searching for the single perfect exercise? One that scorches body fat, builds muscle, boosts endurance, and also keeps you from getting a painful lower back? Brother, you just found it! Because of such credentials, the swing is the sparkling jewel in the kettlebell training crown.